Yesterday, a new CD was released. 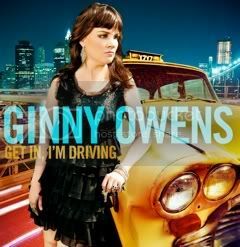 Ginny Owens' new work, Get In, I'm Driving hit the shelves. I've had the chance over the past week to listen to this CD, and it has been fun. Energetic, upbeat... and a nice change of pace. Reviewing music isn't my forte, so I'm just going to tell you a bit about it, and then give you the chance to win a copy for yourself. I love the organizations she is supporting! So would you like to win a copy? To enter, just leave a comment telling me who you think would most enjoy this CD if you win it. Want some additional chances to win? Leave a comment for each that you do! Follow my blog using Google Friend Connect, or Networked Blogs, or both. Leave a comment for each. Like Ginny Owens on Facebook. An extra entry if you tell her I sent you. Enter my giveaway for Theo Presents. Promote this giveaway on your blog, facebook, or twitter. This giveaway will end next Wednesday night, Sept. 21, at midnight. I will use random.org to draw a winner. If I am unable to obtain the shipping information for the winner after a reasonable attempt, I reserve the right to draw another winner. I'm not sure if Addison or I would enjoy the CD most. I might listen to it more b/c I'll put it on when I go run. I follow with Networked Blogs too. I entered the Theo giveaway, too. Thank you! I believe my daughter and I would both enjoy this CD. I would LOVE this CD! I heard Ginny in concert about 6 years ago and have enjoyed her music ever since! Networked blogs follower - liz t. n.
I like Ginny Owens on FB - liz t. n.
I know my brother would enjoy the cd he loves music. I was having trouble with the comments earlier, so not sure if this one already showed up....I 've always liked Ginny's music, so I would be the person in my household to enjoy it most. I told Ginny(On FB) that you sent me! tawnyamarie at gmail dot com. My wife Mandy would love it!